The public footpaths that cross the farm have been closed, with security and dogs stationed either side of the stile, intimidating residents, walkers and passers-by on the lanes. There is no notice of any temporary closure on the Gloucestershire County Council website, so which authority(ies) have granted this footpath closure? In other news, a video showing scenes of the eviction posted on facebook has been removed “per a report that it was unauthorized”. Also, Bennett’s solicitor sent a letter to wordpress asking them to remove this website and disclose the names and addresses of those who administer it (wordpress said they will not take any action for now). What is going on down on the farm that Bennett is so afraid of people seeing? What is he scared of being publicised online? We have moved a bit further away, to get a breather and to not hear the sound of Bennett’s goons continuing to trash the woodland that was our home. We are still around, and doing relatively well. We are warmed by the wonderful support we continue to receive. Also by what we hear about the actions being taken by local people, such as keeping an eye on what Bennett’s henchmen are up to on the farm; writing letters to the council and newspapers; and apparently some are refusing to pay their council tax in protest at the so so far undisclosed amount spent on policing to facilitate the destruction. Big love to all our friends – old and new, local and distant, who have shown support in millions of different ways. There are so many people out there who are sick of this nonsense. We are many, we are strong and we not going away. “The complicated legal situation regarding the ownership of Yorkley Court Farm has been well documented. The Yorkley Court Community Farm members currently living on the lower part of the land have been instrumental in finding us, the rightful owners of the property, finding other parts of our dispersed family and informing us all of the circumstances surrounding the ‘sale’ of Yorkley Court two years ago. Unfortunately despite the trustee of the estate knowing of our existence, the sale was allowed to complete and furthermore none of the rightful owners have received any proceeds from this sale. It’s been crazy times. Our houses are gone, but our community is intact, living in the woods. Two of our cats and a chicken are still on the farm, but so far we have been physically prevented from rescuing them. We are battered but not broken, and figuring out our next steps. We are extremely grateful for the support and generosity that we have received from local people, and we now have almost everything we need to survive. The only things that would currently be really useful are: fruit, dog/cat food, head torches, AAA batteries and socks. 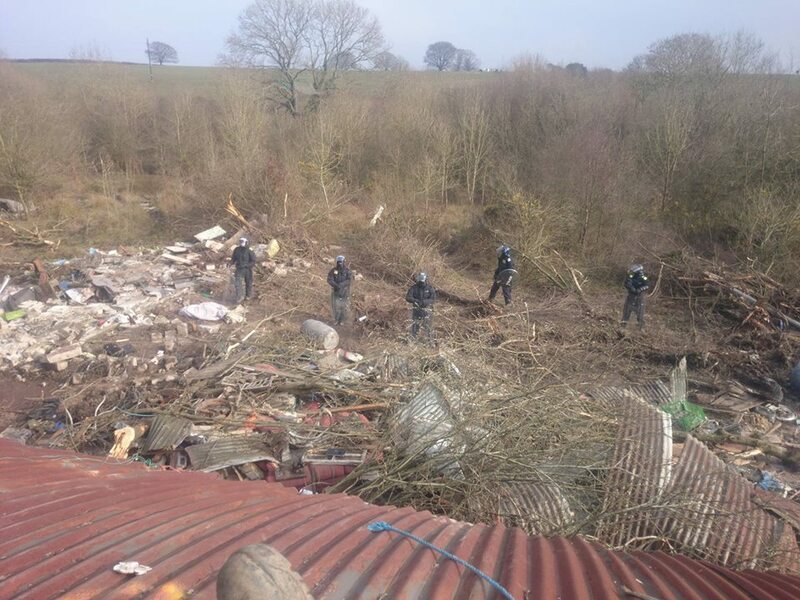 Throughout thursday, friday night and saturday, workers hired by Brian Bennett have devastated the environment of Yorkley Court Community Farm, and unlawfully destroyed pre-existing buildings which they did not have permission to destroy. These include the ex-military hangar buildings. These actions are against both environmental and planning laws. This is particularly ironic because the Forest of Dean district council planning department agitated for the removal of Yorkley Court Community Farm and its residents on the basis of planning law. Since thursday, many fires have been started around the site by Brian Bennett’s hired workers and bailiffs. They have burned houses that were still in trees, and scorched the trees themselves. Other trees they have ripped from the ground needlessly. – The above described actions. – The corrupt history of the land, its ownership and sale. – The environmental problems involved with industrial farming, and the barriers in place that prevent alternatives being found. – The unbelievable financial and legal difficulty that faces any group of young people that wish to live and grow on the land. Today at 2pm a group of councillors and local residents walked around the site of Yorkley Court Community Farm to ensure that the footpaths through the site are accessible. Employees of Bennett have been acting in a threatening manner towards people using these paths. Many bad things have happened in the last 2 days but we have managed to maintain a continual presence on the land. People held the big hangar Until late yesterday night. Resistance is on going, please show support if you can. We need more people to reoccupy Yorkley Court. We are facing some thuggish violence on the ground. This is an opportunity to show that people cannot be squashed by money and corruption. Although events yesterday were bad, we have a strong chance to hold onto the land if people try. We hope that members of the local community will be able to come and give input into how you want the land to be used and defended. Please do not fear them.